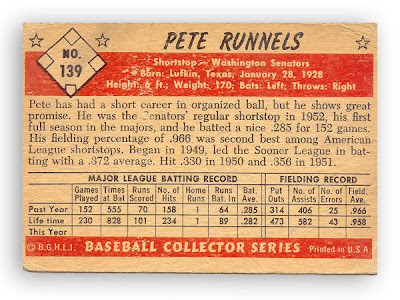 Baseball card from the 1950s featuring Washington Senator shortstop Pete Runnels. 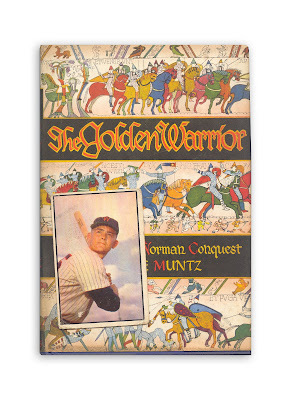 Found in "The Golden Warrior" by Hope Muntz. Published by Scribners, 1950. That is a 1953 card, and probably worth some money as it comes prior to the great expansion (or fad) of baseball cards about 5 years later. Also, it is not a Topps card and that may enhance its value. Runnels twice won the American league batting championship, 1960 & '62 if I recall correctly. 1953 was his third year in the majors. This is a Bowman color card, a desirable set and format. A quick search gives a "book price" of $90, but you can buy one for $20 or less. Not without value, but not exactly a windfall.